It all began with a prayer. A big and bold prayer—that God would lead Norberto Obermann to do something so challenging it could not be done alone. That, without God, it would simply be impossible. Born in Argentina, and having pastored there and in Brazil for the better part of three decades, Norberto would soon see what happens when such prayers are offered up in faithful surrender. Through a variety of unfolding events, he and his family would be called to pastor North Modesto Church of God in Modesto, California. 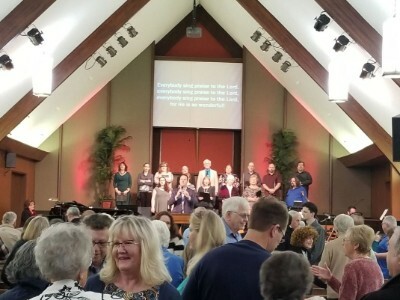 The quadrilingual pastor—yes, he can speak four languages!—was a perfect fit for the rapidly evolving demographics of the north-central California city. It all made sense to the church and the Obermanns. But God didn’t answer their prayer in the way they were expecting. Instead, they embarked on an adventure that would last two years. Paul Dreger (RP, Northern California) installing the Obermanns at North Modesto. “It was a joyous day of celebration,” he reflects. Everyone would soon recognize that the process was entirely out of their hands. 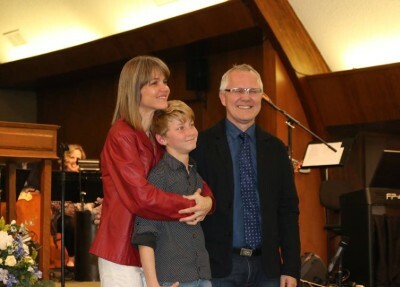 Sure, North Modesto Church of God officially called the Obermanns to be their pastor. Indeed, the Obermann’s acknowledged this divine appointment and accepted that call. But apparently the governing authorities weren’t so sure. A man, born in Argentina, living in Brazil, with his wife who was born in Brazil, now seeking to enter the United States? Policies and procedures in place to handle matters like this were complicated, to say the least, even in flux. They put the matter into God’s hands, and that was all they could do. Jim with Claudia & Norberto, and one of their sons, Pedro. Norberto grew up in a home of committed Christians. 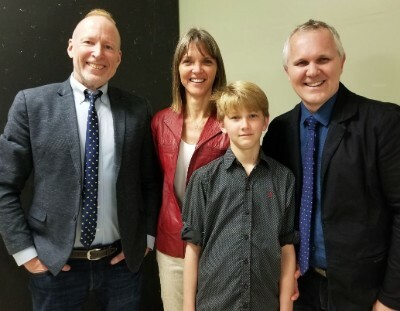 He accepted Christ during a revival service and, after a few rebellious teenage years, recommitted himself and accepted a call to ministry. In 1990, he married Claudia, daughter of Mario and Natalia Hort. Mario, known as the voice of CBH (Christians Broadcasting Hope) in the Portuguese language, is also the pastor of the Rondon Church of God, where Norberto and Claudia led for twenty-one years. North Modesto Church of God on installation day. 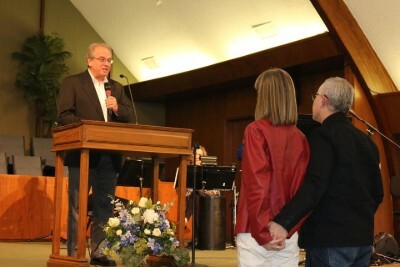 Please continue to pray for the Obermanns and North Modesto Church of God. Please also pray for the family’s continued assimilation, and for Claudia—a music teacher—looking for a chance to teach but encountering closed doors so far. Norberto and Claudia thank the Movement in the United States and Canada for prayerful support. In California, across North America, and around the world, the Church of God is taking back what hell has stolen. Join the movement. Give life. Donate today at give.jesusisthesubject.org. This entry was posted in All Church of God, Western and tagged adventure, application, Argentina, assimilation, bilingual, bold, Brazil, CA, California, CBH, Christensens, Claudia Obermann, cross-cultural, faith, historic, history in the making, hurdles, immigration, international, Jim Lyon, journey, language, languages, Latin America, Mario Hort, Modesto, multicultural, multilingual, Norberto Obermann, North Modesto Church of God, Northern California, overseas, Paul Dreger, Pedro Obermann, pray, prayer, prayerful, precedent, quadrilingual, risk, South America, The Church of God of Northern California Association, trial, visa, waiting. Bookmark the permalink.